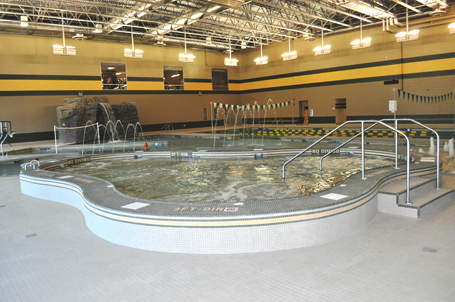 Colorado State University wanted to update their recreation center into a modern, state-of-the-art facility to accommodate students and faculty with the latest fitness programming spaces and equipment. With the design expertise of Hastings+Chivetta and Counsilman-Hunsaker, the Student Recreation Center includes many new enhancements. The new center includes an additional 73,800 sq. ft. bringing the total facility to 175,300 sq. ft. that contributes to the student experience by providing such amenities as: rock climbing wall, lobby with lounge area, new pool and a spa, fitness studios, multi-activity gym, locker room renovations, smoothie bar, and staff office spaces. The Student Recreation Center achieved the U.S. Green Building Council’s Leadership in Energy and Environmental Design (LEED) Gold certification for energy efficient design. In order to obtain LEED certification, the building was designed with many sustainable features including construction waste recycling, sustainable materials and finishes, and energy efficient mechanical/electrical upgrades.